Longing to explore its amazing backwaters and eco-tourism, Kollam was my most awaited tourist destination until an invitation. Yes, it was an invitation to attend the wedding of my classmate’s brother in Kollam. This invitation doubled my excitement that pushed me with my five friends from Pune to Kollam via a quick but pleasant flight journey. However, before boarding, our group had decided one thing: A rejuvenating stay for four nights and five days in a homestay on the right bank of the famous Ashtamudi lake. Believe me; this was the most admirable decision, as it added much fun and memories to our dual-purpose travel (attending the wedding as guests and exploring the town as tourists). Regarded as the gateway to the backwaters of Kerala, the Ashtamudi has a bustling shore adorned by several resorts, holiday homes, and food hubs offering authentic Kerala cuisine. The lake has a distinct wetland ecosystem and a big octopus-shaped aquatic body with several branches. The most famous activity here is enjoying a cruise on a houseboat, which is locally known as kettuvallom. These boats are authentic floating cottages offering all modern amenities, regardless of whether you choose a luxury boat. 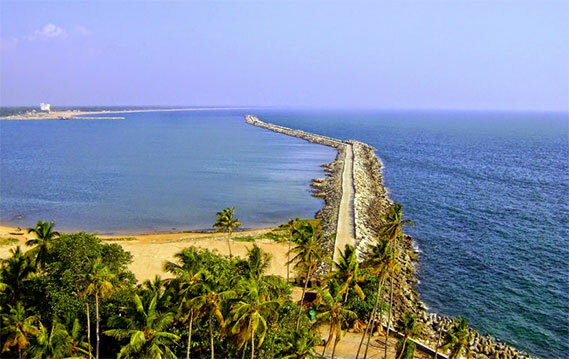 If you choose a one-day trip, the main attractions are the Panmana Beach, the yard for building houseboats at Alumkadavu, and a coir-making sector. You can even go for an 8-hour trip to Alappuzha through a cruise of the Kollam Boat Club. On this trip, you can explore water-bound hamlets, canals, and lakes; all exposing the backwaters’ charm in full sunlight. Another alternative is a houseboat trip to Munroe island in the backwaters, where you can go back to the Stone Age by spotting the different tools and monoliths. My group loves history due to which we had taken this trip. Willing to continue the historic heritage tour, our next target was the seaside hamlet of Thangasseri, which is 5 km away and accessible by a bus available at every 15 minutes from Kollam. The main attraction here is an ancient Portuguese fort in ruins and the soothing 18th-century churches. Apart from that, the 115-year old Thangasseri Lighthouse is another sight to explore after 3:30 pm. This is a place with lot of Anglo-Indian population. Lastly, we decided to spend one full day at the eco-friendly destination of Thenmala. It hosts the eco-friendly tourism project, the first one to be seen in India. The area is covered by tea and rubber plantations, and dense forests. Some of the most exciting things to do here are touring the Deer Park housing rehabilitated deer and 5000-year old rocks, rock climbing and mountain biking in the Adventure zone (tedious! ), and tracking on one of the winding trails in the Leisure zone. Despite a cheerful trip, we did not have enough time to explore the other attractions. Still, we enjoyed and came back with lots of green and blue memories.